Despite the cold weather, there are actually a lot of pluses to look forward to throughout winter. After all, nothing sounds dreamier on a stormy day than snuggling down under a wool blanket in lush pyjamas with a glass of wine in front of the fire. It’s time to switch up your outlook that the winter months are dreary, cold and hard. You’re not only setting yourself up for an uncomfortable season, but also setting an unenjoyable standard about your perception of those colder months. It’s far better to see winter as a chance to recuperate, rest and prepare for the busy summer months ahead. Winter brings ample opportunity to relax on the couch under your favourite throws, get through your reading list and devour many heartwarming meals and desserts. Now that really doesn’t sound so bad, does it! If you don’t have the luxury of a beautiful log fire in your home, you can still create a warm and inviting space where you’ll love to pass your time during the colder weather. – Keep your home comfortable and inviting. A home that feels inviting will constantly cheer you up. Light some beautiful scented candles, turn on your heaters and experience the delight of a sweet smelling home. – Switch lights on and keep your home well lit. Ambient lighting is perfect when you’re having a pyjama kind of day. Grab a blanket, snuggle up in a well lit part of the house, and you’ll instantly feel comforted and in touch with the season. – Get your bake on! Baking not only fills your home with beautiful inviting smells, but it’s also great as therapy for dispelling the winter blues. Cakes, muffins, cookies, bread and rolls are just some of the delicious foods to try. – Create a warm space. Use throws, blankets, drapes and cushions to create a living area that is the perfect space for your winter hibernation. Use lamps to create ambient lighting, put some music on low and pour yourself a glass of red or enjoy a meal by candlelight – winter romance for the win! Reading, relaxing and romancing are all important, but of course but there’s always the risk you’ll start to suffer from cabin fever. In order to keep your motivation soaring throughout winter, there are a number of things you can do to lighten your mood and keep you feeling your best. – Bring out your inner chef. Experiment with different foods and try healthy options of warming food to keep you on top of any winter illness in the air. Heat up some tomato soup and a bread roll, or enjoy a baked potato – a classic winter favourite. – Enjoy staying active. It’s often harder to find the motivation for exercise in winter, so consider joining a walking group or signing up for a run to train for. Movement is a fabulous way to stay warm so if you’re finding it’s cold at home, head outside for a winter walk instead. Your delightful couch and winter throw will still be waiting for you upon your arrival back home. – Get some daylight. If the sun makes an appearance, make sure you head outside for some quality sun basking. Just a small touch of sun exposure can help to really lift your mood. There can be a certain amount of uncertainty associated with all the time spent indoors. Some of us are hard on ourselves for not being productive enough. However, allow yourself to ignore your productivity expectations a little and rather focus on self love and giving yourself, your home and the people you love some quality time and nurturing. It is well within your rights to curl up by the fire as many times as you need and settle in with a cosy wool blanket and a book. You’ll no doubt find a number of spaces in your home that you become attached to throughout winter. Little decorator accents can make your space all the more homely and personal when you’re spending a lot more time indoors. Get creative with your throws and wool blankets. Simple little touches will help to transform your space from a house into a home. Pick out your favourite pyjama sets and prepare for your most indulgent winter yet! Failing the above, you could always go on a Winter Holiday and spend time in someone else’s warm winter wonderland. Create a winter wonderland or just go to someone else’s! 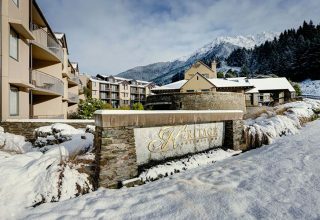 Win a wonderful weekend in Queenstown at Heritage Hotels Queenstown.